What are the functions of the elevator inspection switch? The inspection switch is used to switch between the normal operation of the elevator and the inspection state. When it goes to “check and repair” the elevator does not respond to incoming and outgoing calls and cannot travel at high speed. What are the functions of the elevator inspection switch? 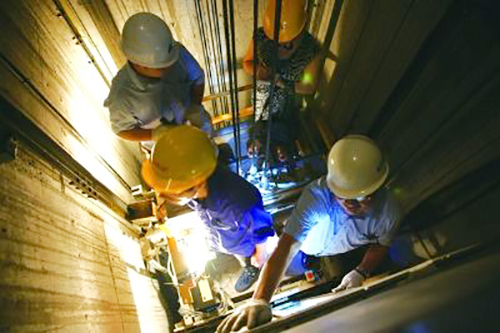 What should be noted when the elevator is overhauled? More information is needed on matters needing attention during the operation and use of the elevator. If the elevator needs to run slowly during inspection, the number of people should not be less than two. Also pay attention to safety, especially when operating on the top of the car. When the cage roof is undergoing inspection and operation, it shall close all the doors of the outer hall before running slowly. When the elevator runs at a slow speed to a certain position, if the inspection of electrical and mechanical parts is needed, the inspection personnel should first cut off the emergency switch on the top of the car or the emergency button on the car’s control panel before the operation. If the elevator is out of control but the safety clamp is not working, the personnel inside the elevator should remain calm. In case of failure, the personnel in the elevator shall use all communication facilities to inform the related personnel. If an earthquake occurs, the elevator should immediately stop operating on the nearest floor. In case of fire, the elevator should be moved to the safe floor as soon as possible, and then the personnel inside the elevator should be evacuated safely. After all the personnel are evacuated, the power of the elevator should be cut off, and the doors of each floor should be closed. If the elevator is out of control, the emergency stop button should be pressed immediately, and the personnel inside the elevator cannot open the car door to jump out in case of danger. Posted in Technology and tagged cautions for elevator maintenance and repair, elevator emergency stop switch of car-top, elevator inspection switch position, elevator safety gear, elevator spare parts supplier, functions of elevator inspection switch, where can I buy the elevator parts needed for maintenance.